OK so you are part Irish and your friends think you are trouble then maybe you should warn the rest of the world by wearing a t-shirt like this. Of course this shirt will look great on St. Patricks day to. 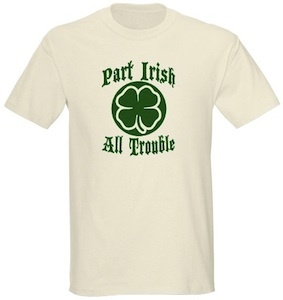 And worry not it is available in all kind of styles from kids to women’s and colors to so check out this Part Irish, All Trouble T-Shirt.